As Jack Fay remembers it, it was just a quiet business dinner with six people in a small meeting room at the Ojai Valley Inn. The air wasn’t charged with the momentous changes about to take place. Instead, they discussed legal incorporation issues and health insurance premiums. Dr. Ethel Percy Andrus organized the meeting. She represented the Grey Gables in Ojai on behalf of the National Retired Teachers Association, and Fay was her lawyer. The others at the meeting were Ruth Lana, Andrus’ long-time lieutenant; Dorothy Crippen, Andrus’ cousin; Leonard Fialco, the assistant to the sixth person present, Leonard Davis, an ambitious if yet only modestly successful insurance broker from Poughkeepsie, N.Y.
During that Ojai evening in 1958, the American Association of Retired Persons was born. And what it meant to grow old in this country changed dramatically. At first, the AARP was structured as a mechanism by which the National Retired Teachers Association, founded in 1947 by Andrus, could sell health insurance to the general public. The NRTA had been selling policies to retired teachers since 1956, and it had proven both profitable and popular. Insurance companies had turned Andrus down 40 times in the past 11 years. Yet in those pre-Medicare days she knew that people over 65 deserved the security and dignity that comes from knowing that they could rely on a doctor’s care. When Andrus started the NRTA in 1947, 75 percent of people over the age of 65 lived with their relatives and 55 percent lived below the poverty line, according to the National Center for Health Statistics. In 1940, life expectancy was 60.8 years for men, 65.2 for females. In 2007, life expectancy figures were 75.4 and 80.4 respectively. Some of the increase in lifespan can be attributed to medical advances, which the AARP has advocated and funded. Some could also be plausibly attributed to the dynamic lifestyle that Dr. Andrus pioneered and of which she was a living example: a lifestyle based on exercise, travel, lifetime learning, second careers, political and social activism, volunteering and community service. Despite its modest origins in Ojai, the AARP now has 40 million members and is considered one of the most powerful nonprofit organizations in the United States. Its magazine has the largest circulation of any periodical. Its lobbying arm in Washington, D.C, is considered the most formidable. The organization extends into every area of aging, from leading-edge research to group travel discounts. Fay, a former Ojai mayor and city councilman, is still practicing law. He is the sole survivor of that meeting since the death of Davis in 2001. Davis put up $50,000 in startup money. Dr. Andrus founded Modern Maturity magazine, now AARP Magazine, which lobbied for the interests of the elderly and, perhaps not coincidentally, served as an excellent marketing vehicle for the health insurance policies in those pre- Medicare years. Within a year, the number of policies written went from 5,000 to 15,000. Within a few decades, Forbes magazine listed Davis as one of its 400 wealthiest Americans, with a personal fortune estimated at $230 million at the time he sold his Philadelphia-based Colonial Penn Group in 1984. If anyone could have predicted it, it would likely have been Dr. Andrus, who founded the NRTA in 1947 before moving to Ojai from Glendale in 1954 to open a revolutionary new retirement home for teachers at Grey Gables. She was born in San Francisco in 1884, the daughter of what she described as “a struggling young attorney” and “his proud and admiring helpmate.” She graduated with a bachelor’s degree from the University of Chicago in 1903 and began her long and storied teaching career at the Lewis Institute, the first junior college in the country, now the Illinois Institute of Technology. She volunteered regularly at the nearby Hull House, founded by prominent reformer Jane Addams, who in 1930 became the first woman to win the Nobel Prize. At the time of Andrus’ volunteer service, however, the Hull House, founded just a few years earlier in 1897, was still an open experiment in social democracy, providing spiritual and educational uplift for its neighborhood of newly arrived immigrants in some of Chicago’s poorest neighborhoods. Each week, as many as 2,000 people came to the settlement house for night school classes, kindergarten classes, its famed public kitchen, its art gallery, gym, bookbindery, drama groups and library. Dr. Andrus might be seen as a product of the Progressive Movement, which arose in the late 19th century as a socially responsible response to the abject poverty in which many of the new wave of immigrants lived, as well as against the greed of the Gilded Age of robber barons and growing economic inequality. Crusading journalists like Ida Tarbell and Frank Norris brought attention to the dangers and humiliations faced by factory workers and farmers. In 1906, during Dr. Andrus’ service at the Hull House, Upton Sinclair’s The Jungle, about Chicago’s meatpacking plants and stockyards, was published. With its nauseating descriptions of filthy practices and labor abuse, it led to such reforms as the Pure Food and Drug Act. The story of a Lithuanian immigrant and his family living in squalor and abuse, The Jungle intimately described many of the people for whom Addams, and Andrus, sought to provide a ladder out of poverty. Her father’s failing health and eyesight brought her back to California. She took a teaching position at Santa Paula High School, which may have been her first exposure to Ojai, though she is said to have selected Ojai for her endeavors after giving a talk at Nordhoff High School in 1953. In 1916, she was offered the assistant principal position at East Los Angeles High School. The following year, the principal retired and she was offered the job. 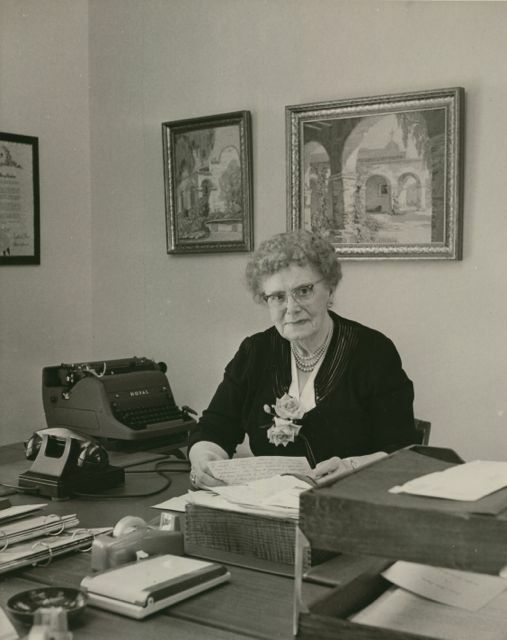 At age 32, Ethel Percy Andrus had become the first female principal of a large, urban high school in the state of California. The lessons Ethel Percy Andrus learned at Hull House would serve her well over the next 28 years. The school was notorious for its high rates of social dysfunction and juvenile delinquency. Despite the grand homes on the bluff overlooking the Los Angeles River, the district was also crowded with coldwater flats and tarpaper shacks from immigrant influxes: Chinese, Japanese, Italian and Mexican families particularly. Lincoln Heights, considered the oldest neighborhood in Los Angeles, was always ethnically diverse, and racial clashes were common. It was the setting for the infamous Zoot Suit Riots, which began in 1942 because a Hispanic youth named Jose Diaz was allegedly murdered in Sleepy Lagoon in nearby Williams Ranch. Her father’s hero was Abraham Lincoln. Her nephew was named Lincoln. Lincoln was also the hero of her mentor, Jane Addams, whose father was one of the founders of the Republican Party and a personal friend of the Great Emancipator. In 1919, Dr. Andrus was instrumental in having the neighborhood renamed from East Los Angeles to Lincoln Heights, and the 2,000-student school renamed Abraham Lincoln High School. Dr. Andrus took that story to heart, always working to defuse tensions in the multiethnic community and build a shared sense of purpose. She forged strong connections. She worked with Los Angeles County Community Hospital to train nurses at the school. She encouraged civic associations like the Optimists to sponsor education awards and scholarships. Former athletes came back as coaches. Standout students went to college and came back as teachers. Besides Robert Preston, among her renowned alumni were actor Robert Young (who played Marcus Welby, M.D.) and Cardinal Robert Mahoney. It didn’t take long before Dr. Andrus’ reforming zeal stirred up controversy, and delivered results. For example, she dropped Latin and Greek, and added vocational courses. “The discipline and faith routinely ingrained by the school reduced juvenile delinquency and brought a citation from the Superior Court,” wrote Scott Hart in “The Power of Years,” an Andrus biography commissioned by the NRTA and the AARP. Among her proudest achievements was founding the Opportunity School with but one other certificated teacher, but with a staff of vital teachers: engineers, salesmen, preachers and the like. It later became the Lincoln Heights Adult Evening School,” she wrote. It served as a focal point for a community fractured along ethnic and economic lines. A lifelong learner, Dr. Andrus received her M.A. in 1928, and, in 1930, became one of the first women to receive her Ph.D. from the University of Southern California. She also brought her faculty together into a tight-knit team. Ed Wenig, her drama teacher, moved to Ojai after his retirement to help her with the NRTA. Wenig became an esteemed local historian as well as a columnist for Modern Maturity magazine. Wenig’s daughter, Patty Atkinson, was five in 1956 when the family moved to Ojai. “She was an imposing woman–she commanded a lot of authority,” Atkinson says of Andrus. Atkinson says her father adored Dr. Andrus, serving on many boards with her, including the NRTA, and helping with her many writing and publishing ventures after moving to Ojai. Atkinson remembers her father, who had quite a peripatetic career including a stint teaching in the Philippines before joining forces with Dr. Andrus, talking about the day in 1942 that the Japanese students were rounded up to go to internment camps. “As the buses passed the school, the entire student body stood outside and waved,” she recalls. That measure of human respect was directly due to Andrus’ influence. She also says her father would herd the students into assemblies and stage radio plays while the faculty held meetings. Often, Wenig would have to frisk students for weapons as they filed into the auditorium. Even as Lincoln High School became nationally recognized for excellence, Dr. Andrus’ methods were studied and encouraged by the National Educational Association, her priorities changed to the very local near the end of the school year in 1944. Dr. Andrus was 60 years old, with a full life of significant achievements. But it was while caring for her mother that she became acutely aware of the problems faced by aging people. And so she launched the second, and most enduring, role of her career. The chicken coop incident came not long after her retirement. While she was caring for her mother, Dr. Andrus kept busy with professional associations. She was named director of welfare for the Southern Section of the California Teachers Association, charged with seeing to the material needs of thousands of retirees. It was a job she took personally, having learned that her pension, after 40 years in education, was $61.49 a month plus another $23.93 a month in an annuity, barely even a living wage. While she could rely on family money and other sources of income, she realized that very few teachers had such privileges waiting for them after their careers were over. Most retired teachers in those days were women, who were left especially destitute when widowed. One day a local grocer asked Dr. Andrus if she would check on an old woman he hadn’t seen in several days. He gave Ethel the woman’s address. The people who lived there didn’t recognize the name, but then said, “Oh, you must mean the old woman living out back.” That’s when Andrus discovered that one of her retired teachers was living in a chicken coop. The woman was gravely ill, but had no money to visit a doctor. It was a moment that would charge Ethel Percy Andrus’ life with a new purpose. She set about this new mission with great deliberation. The first step was to organize teachers nationwide in an effort to boost their collective clout. On Oct. 13, 1947, the 125 members of the California Retired Teachers Association present in Berkeley voted unanimously to form the National Retired Teachers Association. That long journey eventually led to Ojai. Dr. Andrus began stumping the country, giving talks about the issues of aging, about the great gifts that elderly people could contribute to society, and about the means and mechanisms by which that pent-up potential would be realized. She brought an evangelical zeal to the task, repudiating the well-meaning social workers, retirement home activity directors, and even retirees themselves who fill the days of retired people with recreational activities like bingo or shuffleboard. Older people need purpose in their life, meaningful and productive work, Dr. Andrus said. She objected to the term ‘senior citizen’ as isolating and demeaning. “We wouldn’t call 45-year-olds junior citizens,” she would say. Model of Grey Gables used at the 1964 New York World’s Fair.the halls of ivy, and hours later with iron firmness about a business matter. Her ability to listen equaled her gift for quick brisk speech, everyone left her company feeling good about themselves, according to Power of Years. the halls of ivy, and hours later with iron firmness about a business matter. Her ability to listen equaled her gift for quick brisk speech, everyone left her company feeling good about themselves,” according to The Power of Years. One of the goals she set for the NRTA was to provide a model facility for active retirement. As she began casting about for a location, she might have remembered Ojai for its warm, dry air and bright sunshine from her days as a teacher in nearby Santa Paula; or she might have had conversations with local residents about the idea after giving a talk at Nordhoff High School, then located on El Paseo Drive. The morning after her Nordhoff talk in 1953, she saw two buildings for sale; a house on the corner of Montgomery Street and Grand Avenue, and a three-story building behind it. The property, Grey Gables, already had several small apartments, common living areas, a library and a large music hall. The NRTA put in an offer. She had a grander vision of what retirement living could be than anything that had come before. Dr. Andrus foresaw a nursing home where the elderly might receive 24-hour care, and where they would actively work, volunteer and participate in the life of their community. The city was skeptical. There were two other applicants for the site: Sam Sklar, who had recently bought Wheeler Hot Springs, and planned to operate the Gables in conjunction with his resort; and Alcoholics Anonymous, looking for a rest home for people in recovery. “The City was also not eager for us, grudgingly granting us the license which was essential to the sale only after being forced to decide between the claims of Alcohol[ics] Anonymous, a resort of uncertain moral standards and a retirement home. Finally, at long last, the City Council felt our institution was the least worst, and Grey Gables was in the forming,” Andrus wrote. Obstacles loomed, however. they hated the necessity of foregoing their dream,” Andrus wrote. The first five years were a whirlwind of activity. Dr. Andrus brought Lana to Ojai as her trusted advisor, and they set to work “often substituting sheer energy for cash, and nervous energy for cash,” she later wrote. They created the menus, arranged the activities and attended the phones 24 hours a day. The first resident, Emma McRedie Turner, from Chicago, arrived on July 17, 1954. “I was absolutely alone here, but the patrol car came by regularly,” she was quoted as saying in The Power of Years. Within 10 years, it had 85 residents. “We of Grey Gables are certain that this project will be a pilot one, the first perhaps of many to prove to the world that retirement can be a dynamic adventure in gracious living,” Andrus wrote. Little did I know what I was getting into. Dr. Andrus brought a large crew of people with her to Ojai from her former home in Glendale, including Ruth Lana, herself a former teacher. Ruth’s daughter, Lora, spent several years in Ojai, first as a student at Happy Valley School, then as an employee of the NRTA and AARP. “I remember opening these countless envelopes and shaking out the $2 [AARP membership fees] inside,” she said. The AARP grew from its first member in 1958 to about 400,000 in 1962, when the membership office was moved to Long Beach. 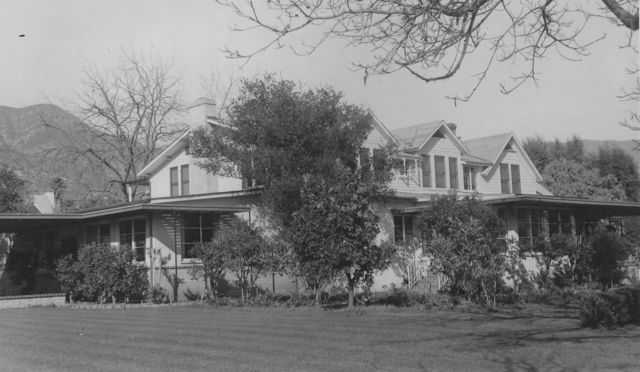 The organization continued to be headquartered in Ojai until 1965, when the entire operation was moved first to Long Beach, then to Washington D.C. Early residents of Grey Gables were attracted by Ethel’s vision of an active life of service, and so the Gables soon became an important asset to the community. Its residents served on local boards, tutored in the schools, taught classes at the Art Center and volunteered throughout the valley. 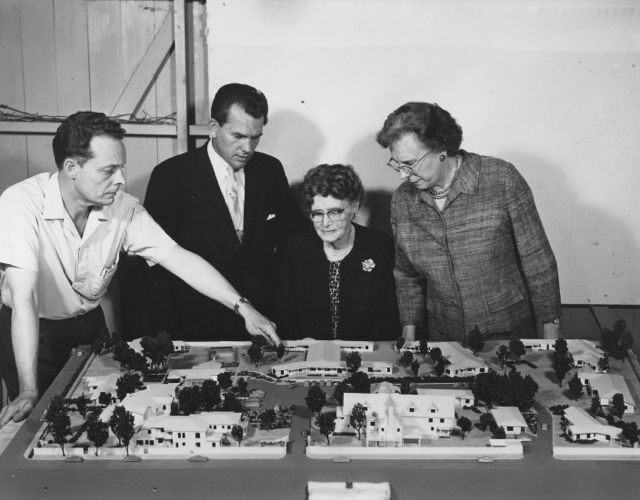 In 1959 the Ojai City Council, which had originally balked at the project, awarded Ethel Andrus and her Grey Gables residents a city proclamation honoring their many contributions to the community. While she was busy lobbying politicians in Washington, D.C. (Lora Lana remembers her mother and Andrus living out of suitcases for weeks at a time), she also kept close touch with her people in Ojai. When a Nordhoff teacher, Herb Smith, and his wife were stricken with polio, Ethel spearheaded the fund-raising effort that paid for their house to be retrofitted for the wheelchair-bound couple. As the NRTA and AARP grew into national powerhouses, the local offices expanded. 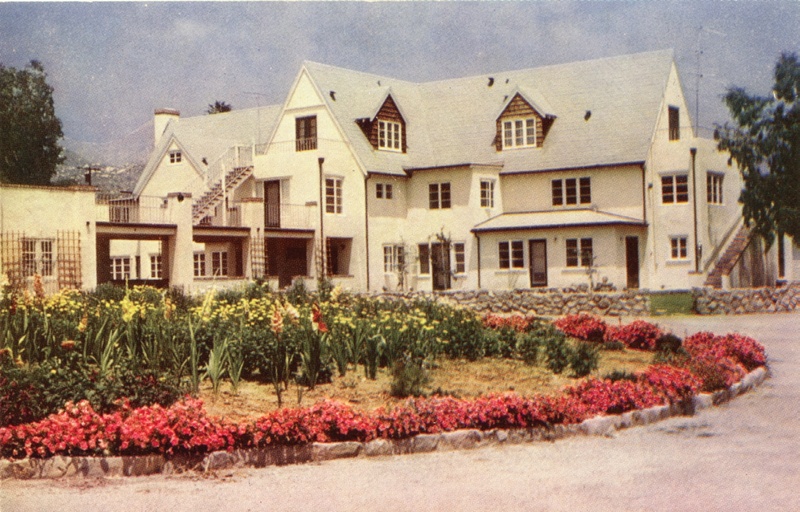 In 1954, the NRTA purchased Sycamore Lodge, a motel next to Grey Gables that fronted Grand Avenue; later, several apartments were added on the back and west side of the property. The Acacias nursing home was built in 1959. Though she was instrumental in many causes of the day–working to end mandatory retirement and age-related discrimination, and to establish the now ubiquitous senior discounts–Dr. Andrus did so in an entirely non-adversarial manner. She didn’t lead marches, sit-ins, political campaigns, etc. It was all done through education, research, advocacy and programs by her own membership organizations. Through the research arm of AARP, she exploded many commonly held myths, stereotypes and assumptions about aging. She used this new knowledge about aging to promote a new image of growing older and retirement … from the end of one’s creative life to the beginning, from isolation to involvement, from deterioration to continued growth, from a time to be feared to a time of opportunity and renewed productivity. Leonard Davis and Dr. Andrus made a formidable team, lobbying tirelessly for the passage of Medicare in 1965. Davis died at age 76 in 2001. Despite a few scrapes with regulators and Congressional investigative arms (he lost his lock on being the sole insurance broker for the AARP during the 1970s), he was a generous benefactor to many causes. In addition to the many millions he and his wife Sophie gave to universities, museums and cultural centers, he endowed the Andrus Gerontology Center at the University of Southern California, the first center in the country devoted to training medical staff to treat elderly patients. Dr. Andrus died July 13, 1967, active to the end, mourned by many and replaced by none. Though she had unlocked the vast wealth held by retired people as they were brought out of isolation and into the mainstream of America, her personal fortune, according to Fay, was valued at less than $100,000. I lived in Ojai 1946 to 1951 at the corner of Oak and Drown. Our neighbor was Ben Noren, a local carpenter and remodeler. Over our common backyard fence I learned he was working on remodeling Grey Gables for retired teachers. Not until I was old enough for AARP did I learn it had begun in Ojai. Seems good things come from small places. at and do it! Your writing taste has been amazed me. Thank you, quite great post. It’s now called The Gables, and is owned by a private company, but it still exists much as it did in the 1950s and continues to operate as a retirement community.